The project is co-led by Mark Maier, Glendale Community College (CA) and Cathryn Manduca, Science Education Resource Center, Carleton College (MN). 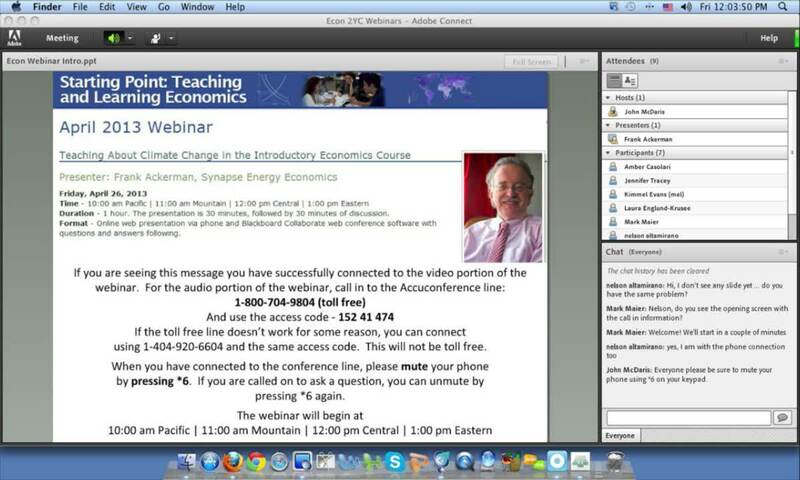 Add the Why study economics page to your department website. It includes short videos of five recent graduates describing how they use economics in their new careers. It also contains information on job opportunities and earnings with an economics degree. About the Presenter: Frank Ackerman, Synapse Energy Economics, is the author of Can We Afford the Future? Economics for a Warming World; The Economics of 350: The Benefits and Costs of Climate Stabilization; and Priceless: On Knowing the Price of Everything and the Value of Nothing. 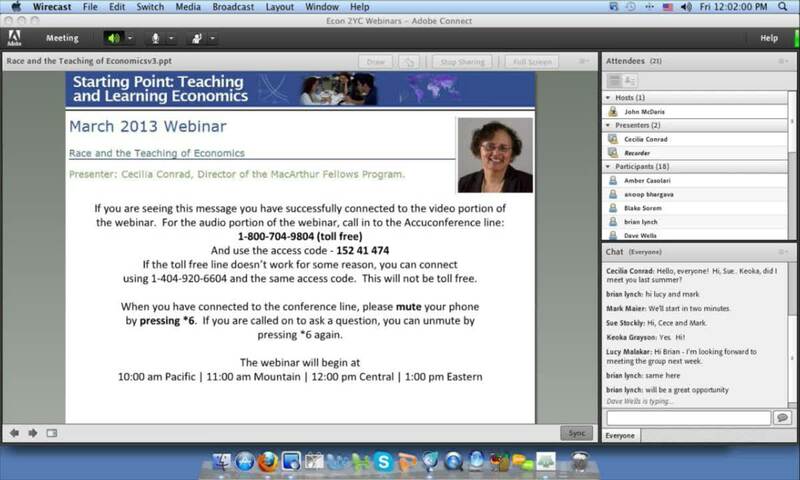 Watch or download the screencast (MP4 Video 102.6MB Mar22 13) of the event. About the presenter: Cecilia Conrad recently was appointed director of the MacArthur Fellows Program, $500,000 'genius' awards given annually to talented individuals. Previously, at Pomona College, Cece served as acting president and professor of economics. Her research focuses on the effects of race and gender on economic status. Watch or download the screencast (MP4 Video 87.5MB Nov30 12) of the event. Download the presentation (PowerPoint 2007 (.pptx) 80kB Nov30 12). About the Presenter: Thomas Buchmueller is a health economist at the University of Michigan. His recent work has examined the relationship between employer-sponsored insurance and labor market outcomes, interactions between the public sector and private insurance markets and consumer demand for health insurance. He is a Research Associate of the National Bureau of Economic Research and was the Senior Health Economist at the Council of Economic Advisers in the Executive Office of the President. 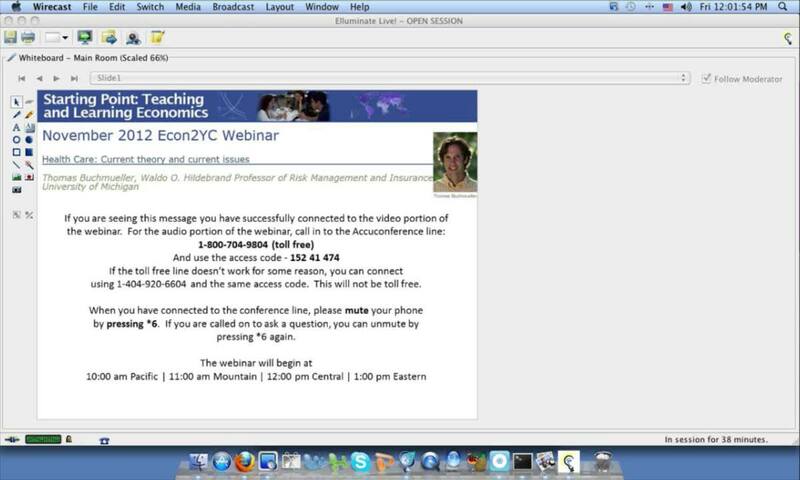 Watch or download the screencast (MP4 Video 127.7MB Oct12 12) of the event. Download the presentation (PowerPoint 2MB Oct5 12). About the Presenter: Russell Pittman is Director of Economic Research, Antitrust Division, U.S. Department of Justice. He is co-author of "The Proposed Merger of AT&T and T-Mobile: Are There Unexhausted Scale Economies in U.S. Mobile Telephony? "and "Consumer Surplus as the Appropriate Standard for Antitrust Enforcement." Russell served on the Core Team of the World Development Report, Building Institutions for Markets and he consults regularly with antitrust enforcers and economic reformers in transition and developing economies, most recently with the Federal Antimonopoly Service in Russia, and railroad restructuring projects in Brazil, China, and Poland. Watch or download the screencast (MP4 Video 79.4MB May24 12) of the event. Download the presentation (Acrobat (PDF) 1015kB May18 12). 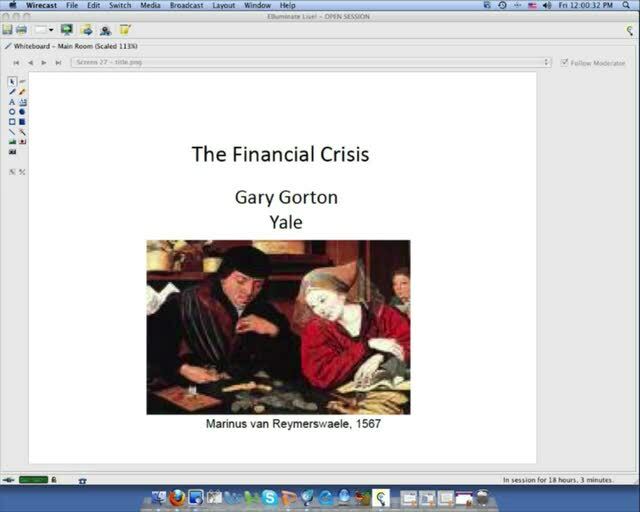 About the Presenter: Gary B. Gorton is Professor of Management and Finance at the Yale School of Management, and Research Associate at the National Bureau of Economic Research. 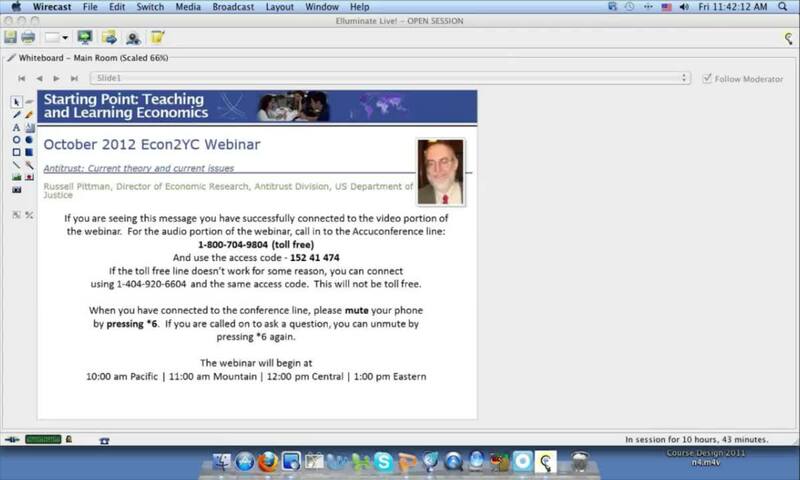 Watch or download the screencast (MP4 Video 76.4MB Apr13 12) of the event. About the Presenter: Dean Baker, author of the weekly news commentary Beat the Press, and frequent commentator in major media outlets, including the New York Times, Washington Post, CNN, CNBC, and National Public Radio. Workshop at Riverside Community College, January 18, 2013. Workshop webpage. 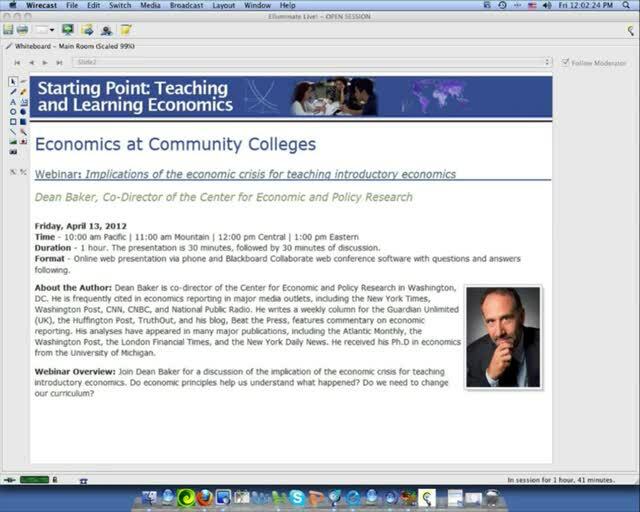 In June 2011 a workshop that brought together 20 economic educators to plan regionally-based outreach programs for community college instructors. The economic educators were joined by 8 experts from other disciplines that have already developed national outreach projects targeting community college instructors. To learn more about the workshop, check out the Workshop Agenda and Participants pages. Community college instructors met at the Chicago Federal Reserve in March 2013 to create new money and monetary policy teaching activities. As a baseline for future work, four regional surveys were conducted to ascertain the current state of community college economics instruction. Results from these surveys are presented. Disciplines outside of Economics have also been working on the challenges and issues facing education at the two-year/community college level. Pages highlighting work done in other disciplines have been compiled with the help of the disciplinary experts who will be attending the workshop. Diversifying Economic Quality Div.E.Q. is an online resource that aims to advance diversity in the economics profession by improving the way faculty and departments present economics to undergraduates. Sponsored by the American Economic Association's Committee on the Status of Minority Groups in the Economics Profession, Div.E.Q. helps economists recalibrate both their teaching and their research with new insights on race, class, gender, culture, discrimination, and inequality. This work is supported by the National Science Foundation (NSF) Division of Undergraduate Education under grant #1043245. Cecilia Conrad, Director of the MacArthur Fellows Program.